4-way valves are one of the most commonly used pneumatic components for directional control. By providing four distinct flow paths, these valves make it easy to reverse the motion of a cylinder or motor. Pneumadyne manufactures two series of four way valves to fit a variety of pneumatic circuit requirements. We offer multiple configurations and port sizes, making it easy to find the right 4-way pneumatic valve for your specific application. If you’re not sure which 4 way control valve is the right one for your pneumatic system, don’t hesitate to contact us. The experts at Pneumadyne will review your performance requirements and help you determine which model will work best for you. 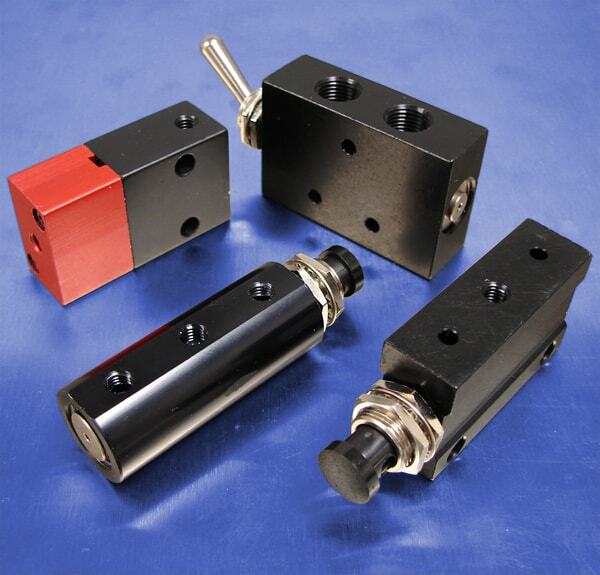 Request a quote on the 4-way pneumatic valve you need, or contact Pneumadyne to learn more. Pneumadyne is a manufacturer of high performance miniature pneumatic valves. We can also assist you with design and engineering of custom pneumatic components or full pneumatic control systems. Request a quote on 4-way valves or other components for your pneumatic system, or contact us to learn more.